Wishlist is a magenta base with lots of teal, blue and pink glitter. The formula is great. I’ve used three easy coats plus top coat (Seche Vite). Bonus: no fishing and (re)placing of the glitter needed 🙂 and drying time is quick. Removal is -as with most glitter polishes- not so easy. But using the ‘foil method’ makes it way easier to remove. Splendid, a jelly-ish purple base with lots of golden shimmer. Gorgeous isn’t it? The formula of this one is also perfect. I’ve used three thin coats plus top coat (Seche Vite). Splendid is a brand new creation that’s not available yet. Lindsay is planning on releasing it soon, together with two other new creations called “Perception and Last Call on Tuesday”. So you might want to keep an eye on her Etsy shop! Well, pink and purple are -besides red, blue and pastel- my favorite colors. So these are both ment for me 🙂 The formula of both is perfect which guarantees a smooth application. 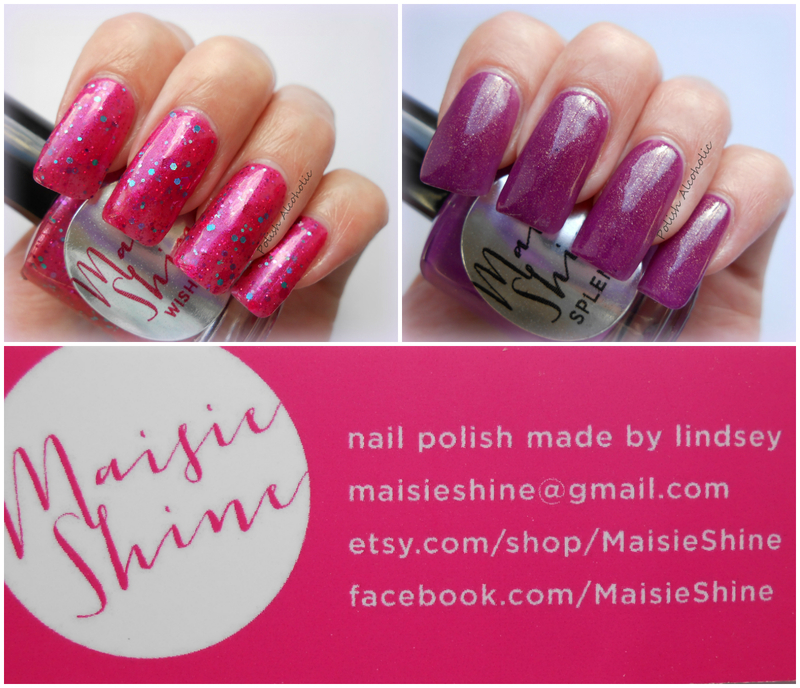 All Maisie Shine polishes are 3 free! And Lindsay offers worldwide shipping. Go get yours at Lindsay’s Etsy shop for €6,84 / $9.00 each (full size). This entry was posted in Indie and tagged indie, indie nail polish, maisie shine splendid, maisie shine swatches, maisie shine wishlist by Polish Alcoholic. Bookmark the permalink. Thanks and yes they are girly 😀 Especially because of the glitter! Love the “Wishlist”…gonna Google the “foil method”…I’ve been using a lot of glitter polishes lately, and I am having trouble removing them…thanks for the tip! Sold out, or it’s not on the website, dang it! The pink glitter “wishlist” should be there! I can’seem to find “Splendid” too 😦 Should I ask if she’s planning to restock that one? Really!!!!??????? haha…. oh… mine is slowly getting better with time.. she was sold out of the one I wanted, splendid… aaaaahhh/&%/&%)&/)/¤%(=!! Splendid is one of her newest creations that’s gonna be available soon (together with two other new polishes) 😀 Keep an eye on her Etsy shop hun!